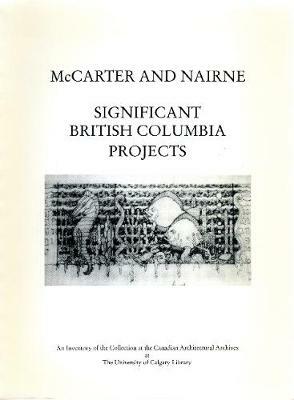 The firm of McCarter & Nairne dominated public architecture in Vancouver from the inception of the partnership between John Y. McCarter (1886-1981) and George C. Nairne (1884-1953) until the completion of the General Post Office in 1958. The respected background and experience of McCarter and Nairne reflected the localization of sophisticated trans-Atlantic architectural practice that both characterized their work and accounted for their success. The holdings of the Canadian Architectural Archives focus on the architecture of twentieth-century Canada and the work of its outstanding architects. The McCarter and Nairne Collection is a very important one within the CAA's holdings, as it is one of the few whose history begins in the twenties on the west coast. As such, it provides a historical context and complement to the CAA's other collections with west coast roots, like the Thompson Berwick Pratt, Arthur Erickson, and Ron Thom collections. It is hoped that this inventory, in both its arrangement and detailed information, will encourage both the appreciation and scholarly interest in one of the most historically significant collections at the Canadian Archtectural Archives.